The way it happens with any other family which goes through a divorce, Brad Pitt and Angelina Jolie wish nothing more than to protect their children. To protect them from the media, from paparazzi, from traumas. It seems like their problems affected their six children, Maddox, Pax, Zahara, Shiloh and twins Knox and Vivienne. And as the biggest concern regarding them is their custody, the kids might suffer a lot more. As the press related, Angelina Jolie is seeking to receive the children’s full custody. She reportedly thinks that this is what the kids need during those difficult times. The Department of Children and Family Services in LA is still conducting inquiries related to Brad Pitt’s accusations of physical and verbal violence towards his kids. Rumors say that he behaved badly with his children in a plane and then in the airport, earlier this month. 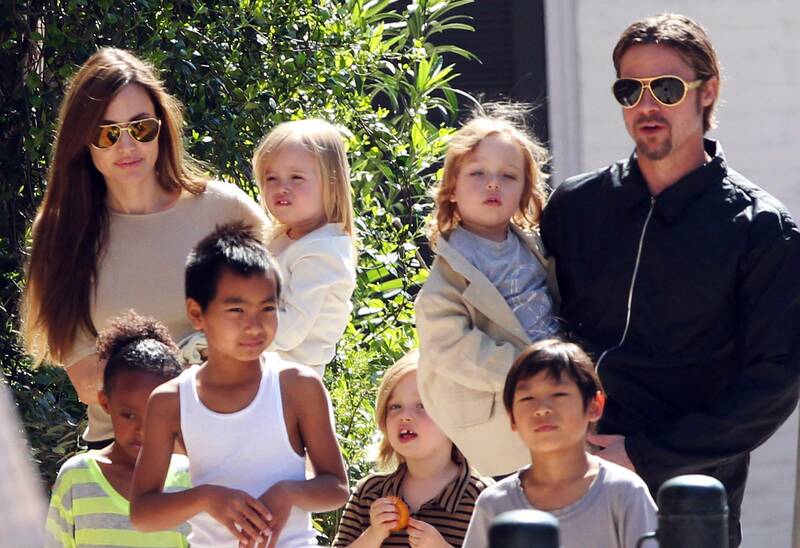 Now, some reports are saying that Brad has not seen his kids since the news of the divorce broke. He really hopes that this will change soon and that he will be able to see his six children. A source has said that Brad wishes to discuss things amicably and to find the best possible solution which will be in the best interest of the children. Reports are saying that all six children are right now living with their mom. More, they relocated in a rented house somewhere in Malibu. Angelina wants to keep them safe from paparazzi’s eyes while they continue to adjust to the situation. Neighbors spotted a security guard carrying four pizzas and some bags into the house. Also staying in the home with them are Angelina’s friends Baroness Arminka Helic and Chloe Dalton, who are reportedly helping her cope with the situation and the kids. Her brother, James Haven, is also helping her. A source said that even if Angelina wants full custody, she does not intend to make this a permanent situation. She understands that Brad must also have a role in the kids’ lives and that co-parenting will probably be the best solution. As for the inquiry conducted, their representatives have not commented on it, but sources say that Brad Pitt has not done anything like this and that he hopes things will be dealt with amicably and quickly. All in all, Brad and Angie are both very preoccupied about their children and will reportedly work together to help them deal with the situation. Brad has specifically said that he wants to keep everything private as this is the best way for their children to be safe. And this is completely understandable. When you are such a famous couple you expect paparazzi to come into your life and to tangle in your personal matters. So what you can do is protect the people involved at any costs and hope that things will work for the best. Right now, this is exactly what Brad Pitt and Angelina Jolie are doing. The UN is launching a Space Mission. How will it work?